The Martin Dawson Trophy 2018 saw a little chaos descend on the event. An incident on the M62 caused some of the travelling teams from Yorkshire and Lincolnshire to arrive late. A normal one and a half hour journey for the Grimsby Corinthians team turned into a four hour journey, making them an hour late for the start of the competition. The 13:00 kick off meant we were three teams and one referee short, not a great start to the day. However with a little juggling, the fixtures were eventually completed. After last years deluge, which brought the football to an early close, at least we got away with a few small showers. Two groups of six teams were involved in the round robin format. Group A consisted of Blackburn Rovers WF, Bury Relics, Grimsby Corinthians, Manchester Corinthians, Rochdale AFC Strollers and Widnes WFC. In Group B were AFC Blackpool Senior Seasiders, Chorley FC CT, Halifax WFC, Rochdale Striders, Sheffield WFC and the 2016 and 2017 winners Wakefield Wanderers. During the days events in the Martin Dawson Trophy 2018 some excellent football was on show, with many strong teams competing. 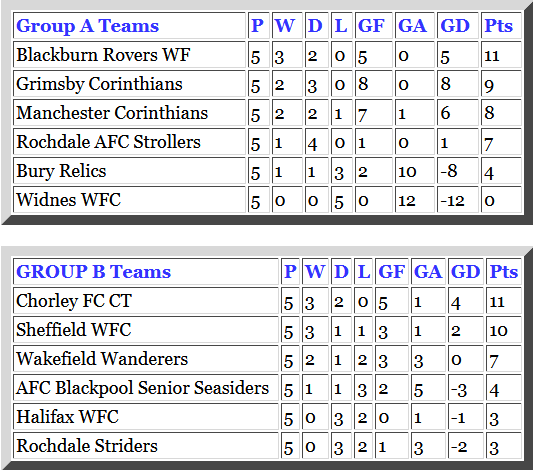 The semi finals were contested by Group A winners, Blackburn Rovers WF and Group B runners up Sheffield WFC. Group B winners Chorley FC CT and Group A runners up Grimsby Corinthians were the other semi finalists. It turned out that both the groups runners up came through the semi finals with 1-0 victories over the groups winners. Grimsby Corinthians & Sheffield WFC Finalists In The Martin Dawson Trophy 2018. The final of the Martin Dawson Trophy 2018 was between Grimsby Corinthians and Sheffield WFC. It could have gone either way but a great strike from the Sheffield player made them the trophy winners with a 1-0 victory. Some photographs of the action, courtesy of Alan Richards can be viewed HERE. 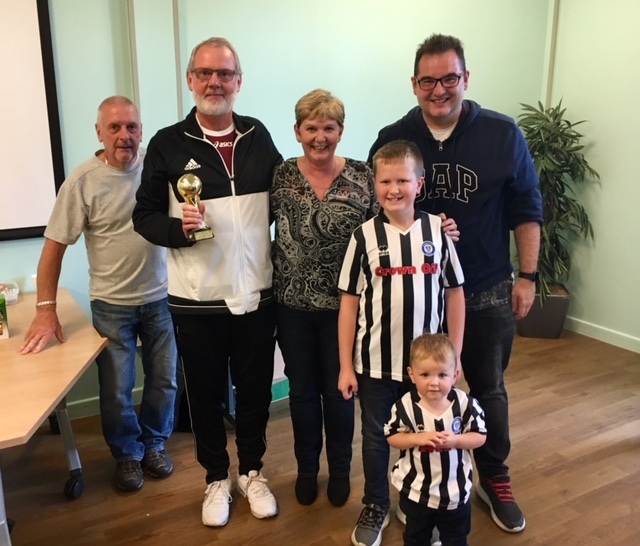 Martin Dawson’s widow, son and grandsons were present at the presentation and awarded the trophies to the eventual winners. 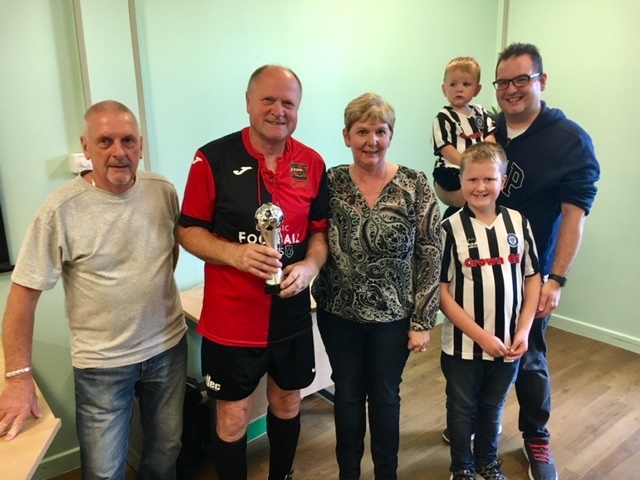 First up was Paul Stead of Halifax WFC who were awarded the Fair Play Trophy for their excellent sportsmanship and example of how walking football should be played. Paul Stead Of Halifax WFC Receives The Fair Play Award From The Dawson Family. The Runners Up trophy was awarded to ChorleyFC CT Grimsby Corinthians, who narrowly lost the final. Sheffield WFC received the winners trophy after their 1-0 victory. 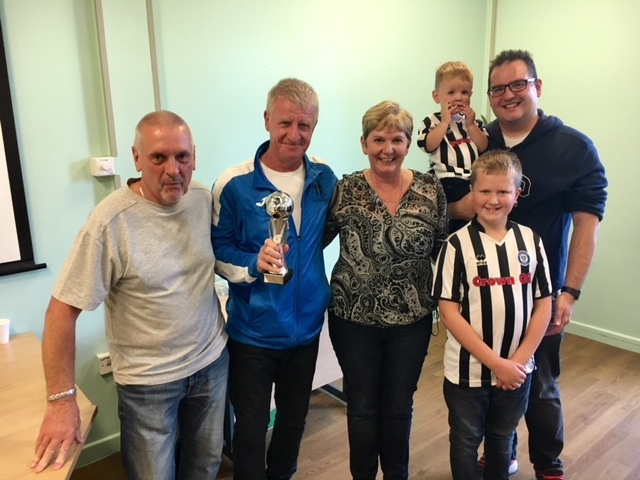 Grimsby Corinthians Receive The Martin Dawson Runners Up Trophy 2018. Sheffield WFC Receive The Martin Dawson Winners Trophy 2018. Sheffield WFC Winners Of The Martin Dawson Trophy 2018. We cannot finish without a word of thanks to our excellent referees, Alan Graham, Matt Howells and Garry Pearce. Mick Hill stood in for Mike Willmore who was unavailable and what a terrific job he did. Mick gave an excellent performance and it shows why he is in big demand for his officiating skills. A great pity you don’t live locally Mick. Finally, thanks to Barry Woodburn for his registration duties, helped by Matt Howells on this occasion, and for running the raffle which raised over £100 for the Strike Association. Also Paul Gardner for hosting the event and organising the buffet. Sadly, a couple of teams left before the presentation but otherwise it was well attended. If you enjoyed the occasion or have any complaints you can make a comment below. We are also on Facebook. Brilliant day, congratulations to all the teams involved, all played in the right spirit. Congratulations to the winners Sheffield WFC. Thanks to the refs who did their usual great job and with a smile on their faces. The organisers are to be congratulated, not just for the original setting up off the event, but the last minute alterations that they had to do. I hope Martin’s family enjoyed the day as much as the players did. Hope to see you all again next season. Well done Bill, great competition and congratulations to all the trophy winners. defeat to Sheffield (due to the player taking more than 1 step on 4 occasions !!). Bizarre. We changed the rule to read “the kick is not retaken” last week and I forget to update Mick, who correctly applied the rules sent to him. Apologies. No problem, it didn’t make a difference to league positions and the guys took it on the chin. An impressive competition. Highly competitive ‘football’ as the report suggests. Well done to the winners, and to the organisers for coping with the delayed arrivals. All Referees were very good. 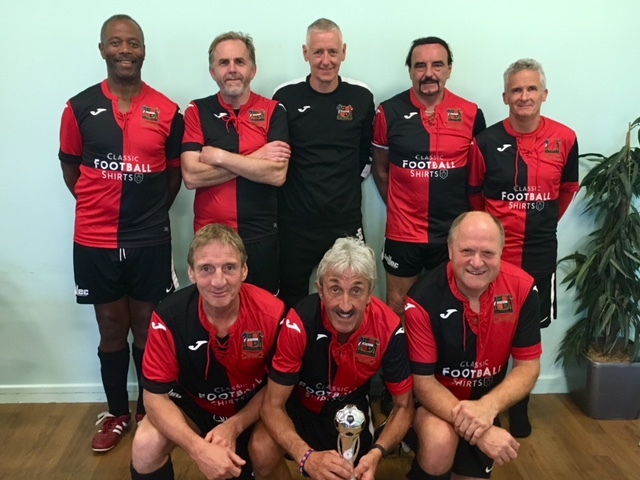 Many of the games were closer to ‘football’ than walking football though – I say that as a neutral spectator for an hour or so. 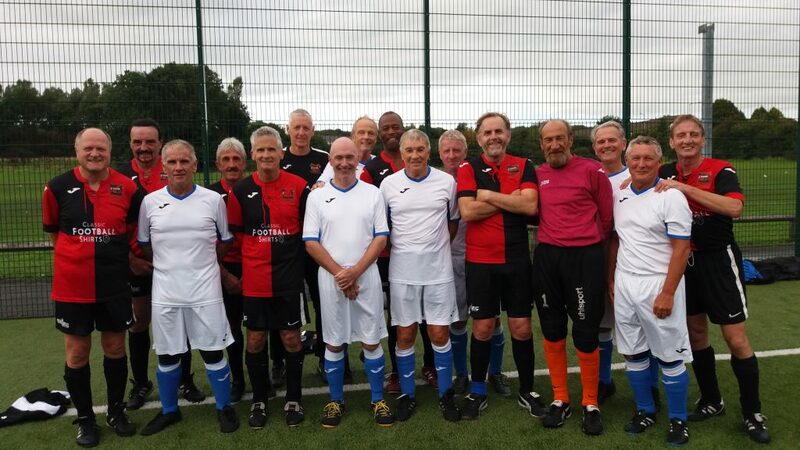 So great credit to Halifax for setting the example of ‘how walking football should be played’. I would very much like to arrange a friendly game in the future. Paul Stead please google ‘Tamestriders’ website and get in touch with your contact details if you fancy one. Well done to the finalists and the winners – the geographical radius of teams attending does the organisers great credit. None of the above comments are intended as criticism. OK, Alan, thanks for your comments. I’ll Google you and see what we can arrange! We really enjoyed the day, a very well organised tournament and great facilities. Paul Stead, Halifax WFC.